Did you know that the KFRW gives a $1,500 scholarship to a high school senior girl? This year our winner was Ms Brenna Matthews from Franklin County. Brenna is very active in the Republican Party and a very outspoken advocate for public policy and supporting candidates. She will be majoring in Political Science at Western KY University. She is shown here with Tina Fox who is Chair of the Scholarship Committee for KFRW. 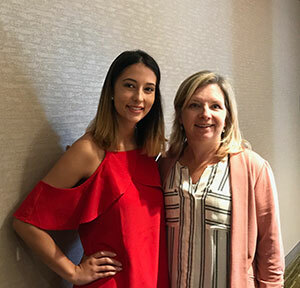 The Kentucky Federation of Republican Women (KFRW) will seek to grant one scholarship in 2019 the amount of $1,500.00 to a college-bound high school senior girl who has been politically active within the Republican Party during her high school career. The qualified applicant will graduate from a Kentucky high school in 2018, is a registered Republican and plans to enroll at an accredited college or university in Kentucky. To apply for our scholarship, print out and complete our scholarship application form. It can be downloaded on your computer and printed out for you to complete at your leisure. Our scholarship form uses the free, downloadable Adobe Reader program which allows you the convenience of completing the scholarship application from home or work. Download the free plug-in from Adobe’s website if it is not already installed on your system by clicking on the Adobe Reader picture below. KFRW Scholarship Chairman, Tina Fox no later than April 1, 2019.